"Columbine" is an all-felt, 17 inch jointed doll with molded and hand painted facial features. 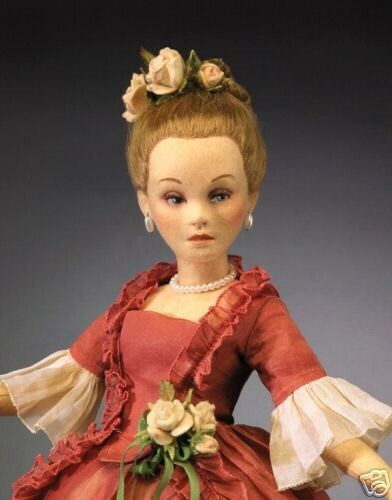 She has a hand-knotted, high quality mohair wig that is beautifully coiffed and dressed with delicate, hand-made rosebuds. 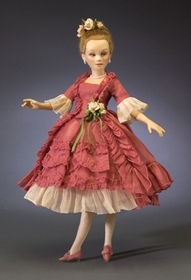 She's wearing a rose colored chiffon dress featuring rows of ruffles and white chiffon fluted sleeves with matching row of white chiffon edging the hem. Wearing organdy costume with felt roses. The dress has an attached organdy petticoat and a separate petticoat of multi-layers of white tulle. 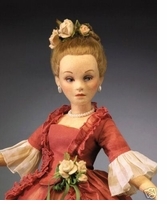 Her period costume also includes sheer stockings; white organdy pantaloons embellished with various rows of ruffles; beautiful rose colored suede heels with gold buckles; pearl earrings and a single strand pearl necklace. A beautiful corsage of hand-made blush colored rose buds is attached to the side of her waistband. One of three pieces in Commedia del'arte Collection and is number 184 of 300. She is still nestled in her original box - NRFB . The white cardboard slipcover cover the RJW box came unglued over the years otherwise as pristine, complete and perfect as the day received from RJW.